JUBA , Sep 5 2012 (IPS) - Police in South Sudan have begun press-ganging every “idle” youth they can find to provide labour on police farms. The State Police Commissioner in Northern Bahr al Gazal state says young men cannot be left to drink tea and play cards all day while food insecurity threatens the country. “Anyone who does not want to cultivate will be captured and brought to plant for us. Whether you are a soldier, or a policeman, or a member of the prison service … if you choose to put on your best clothes to come and loiter in town, we shall take you to work for us. Whether you want it or not,” State Police Commissioner Akot Deng Akot told IPS. A staggering 4.7 million South Sudanese – almost half the population – are food insecure, according to the United Nations. “One million of these people are severely food insecure meaning they can only afford to eat one meal once in two or three days, while the other 3.7 million people are moderately food insecure meaning they can at least afford to eat a meal per day,” the U.N.’s Humanitarian Coordinator in South Sudan, Lise Grande, told IPS in an earlier interview. The countrywide food insecurity is being blamed on a number of factors, including a cereal deficit. According to the U.N. the deficit doubled from 200,000 metric tonnes in 2011 to 470,000 this year. In addition, high fuel prices and a weakening local currency have contributed to the situation. According to data from the National Bureau of Statistics, more than 80 percent of Northern Bahr al Ghazal’s estimated 790, 898 people are affected by food insecurity. And it has resulted in drastic measures by state authorities attempting to encourage farming in the region. Akot even warned people against attending local courts dealing with petty disputes. “This also applies to people who go and crowd at local courts in disputes over ownership of cows. Such courts will not be allowed to operate during cultivation (which lasts from October to December) so that everybody goes to their farms to produce food,” he said. In fact, some arrests have already been made. A local journalist from Northern Bahr al Ghazal state, Hou Akot Hou, said that police arrested dozens of youth under the orders of a local chief, Atak Awan Anei, who is also the brother of Northern Bahr al Ghazal Governor Paul Malong Awan Anei. The arrests occurred in July in Warwar – a market near the South Sudan-Sudan border. Some locals are supportive of the policy. “The government should force older boys who are capable of taking care of themselves and are loitering in town to go and cultivate,” local resident Justin Ayuer told IPS. Northern Bahr al Ghazal state is not the only region trying to institute policies to encourage food production. 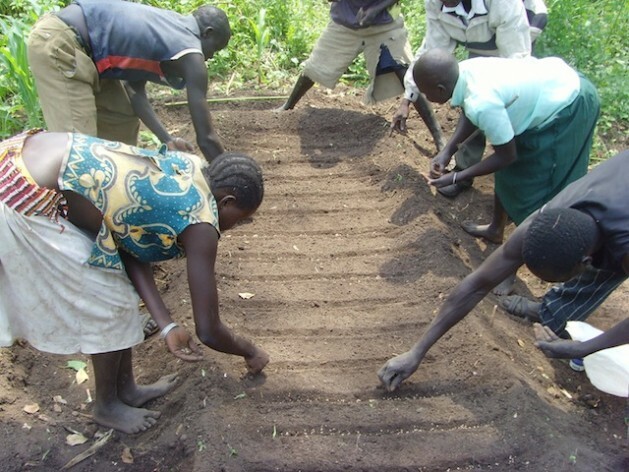 Since April, in Eastern and Central Equatoria state, officials have given civil servants Fridays and Saturdays off to farm. Eastern Equatoria state’s Governor Louis Lobong Lojore threatened to cut the salaries of civil servants who do not use the time off to work on their farms. He said that the measure was necessary as some civil servants were drinking, and playing cards and dominoes instead of farming. Those who did so, he said, would lose two days of pay every week while the programme lasts. Eastern Equatoria state’s Information Minister Felix Otudwa told IPS that he believed the government’s initiative would lead to an increase in food production and security this year. “These days you do not see people sitting under trees drinking tea or playing cards the way it used to be in the past. Everybody is busy farming, even on weekends. The governor, minister and other senior civil servants are all involved in cultivation these days. This year, we will all harvest in a big way,” Otudwa said. But not everyone is comfortable with the forced regulations. Edmond Yakani, the coordinator of local rights organisation Community Empowerment for Progress Organisation, told IPS that the policy was illegal. “Where is the law that allows them to arrest people simply because they are not on a farm during work hours? Who passed that law and when?” Yakani asked. He said that it was equally wrong for the government of Eastern Equatoria to cut the salaries of civil servants who do not use their given days off to farm. “Where is the law that allows them to cut people’s salaries?” Yakani asked. “A law has to be passed, and this can only be passed by the South Sudan National Assembly so that it becomes obligatory for everyone to farm,” he said. He said that the government needed to facilitate voluntary farming by improving access to land, tools and seeds. A state official who spoke on condition of anonymity said that the decision to designate Friday and Saturdays as farming days for all civil servants would affect the delivery of health services and affect patients who badly needed treatment. But Isaac Woja, an agriculturalist and natural resources management expert, said the initiatives might turn out to be successful. “I think people are taking farming seriously as compared to previous years. When you travel you see more crops on more farms along the road side, and this means that more people have gotten involved in cultivation this year,” Woja told IPS. He added that only an assessment after the harvest season would determine whether or not the initiative leads to an increase in food production. Central Equatoria state’s Agriculture Minister Michael Roberto Kenyi told IPS that the policy of giving civil servants days off was making a difference and that civil servants had to lead by example. “Leadership in the past used to be that you should have a house, a garden and a granary. A leader must have these things to be considered a leader. As a civil servant, you need to be exemplary to the community and you cannot be exemplary when your granary is empty,” he said. He said that an assessment would be done by the state after the December harvest. “We are going to conduct an assessment. We will be asking people to tell us the size of area under cultivation or the acreage, the number of hours worked to and the quantity of produce harvested to determine if there has been an increase in food production due to the new initiative,” Kenyi told IPS.